Contemporary and ultra-chic, our Modern Black & Silver Clock makes a bold statement using a minimalist style. Measuring 5.75″ x 7.75″, a single silver ring acts as the body of the clock. Silver second, minute and hour hands sweep across the numberless face. An ebony monolith acts as the clock’s face and as the engraving plate. Our design team will engrave up to three lines of text as well as artwork onto the plate. 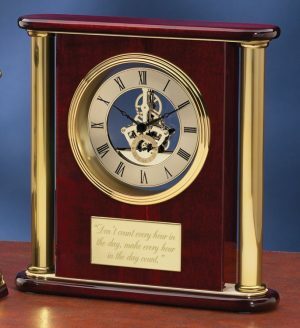 All engraving appears in silver and is included in the price of the clock. Perfect for the lobby or lounge of your corporation, yet it can also be used as an award for that progressive employee who deserves to be recognized. Order our Modern Black & Silver Clock (item BC1025) and show the world how cutting-edge you are!